100% Whole Food Nutrition, Powered by Enzymes! Recommended Use: 2 capsules twice daily for best results. If preferred, 4 capsules may be taken anytime during the day, even on an empty stomach. Enzyme Nutrition for Women contains Enzyme Activated Nutrients™ (EAN) as part of a whole food matrix. It is personalized to meet the unique needs of today’s women. Enzyme Nutrition for Women also contains guaranteed potency probiotics along with nutrient-rich superfoods and daily botanicals. Enzymedica believes the greatest science comes from observing nature. Nature never provides vitamins and minerals in a single isolated molecule. 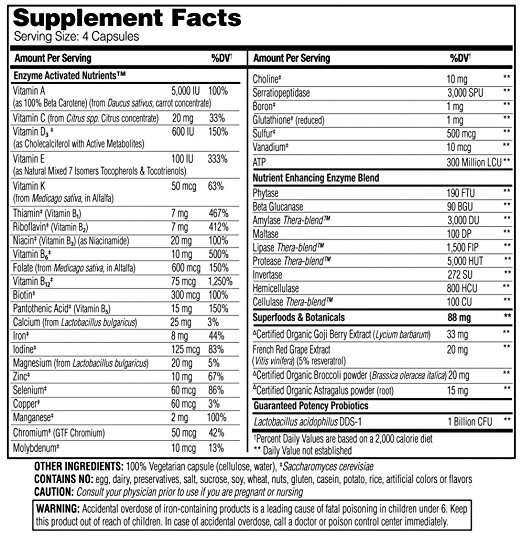 Furthermore, no single isolated vitamin or mineral in any nutrient matrix is solely responsible for a nutritional benefit; it must be attached to cofactors and enzymes to be utilized by the cells of the body.